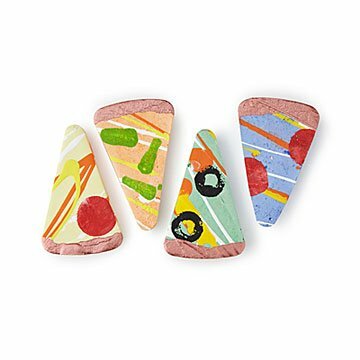 Thanks to a pre-school teacher with a big imagination, kids everywhere can doodle with slices of 'za. You know about the renaissance and surrealism art movements, but are you familiar with the pizza period? It's a thing and its leading artist happens to be your little one. Pre-school teacher Kate Leibrand started making this pizza slice sidewalk chalk for her mini pupils. She thought that if it brings so much joy to her class, why not share it with all kids? Crafted in small batches, Kate paints each piece with its own special glaze to mimic real slices (we've been eyeing the olive one and now we need 'za, stat). Designed to fit in little hands, they make an adorable birthday gift for ages three and up. Handmade in Philadelphia, Pennsylvania. To get your creative ideas off the ground, think like a kid. That’s what Kate Leibrand would say. The Philadelphia based preschool teacher was looking for an innovative way to change up her art class. Using her own larger than life imagination, she decided to combine two unlikely things: food and sidewalk chalk. Her students were thrilled, and now your little one can enjoy the creative designs. You can find Kate teaching or crafting chalk in small batches in Philadelphia, Pennsylvania.